[Born 2011, Left us 2013] I inadvertently started a bit of a debate about whether clusterfluff or late night snack would be the break out hit of 2011. I think clusterfluff had a bit of an advantage as I was in my native environment (my car in the shaws parking lot) while with late night snack I was sitting in the NBC studio cafeteria. Now I did try to be fair by snagging a second serving of late night snack at the press release, but I just wasn't awestruck like some seemed to be. Oh, it definitely wasn't bad, it's a fine flavor, but it wasn't the best ever either. Well, I just had my first pint sample and it's definitely growing on me, though technically I did cheat. See, as I was scooping, I saw this great big puddle of salty swirl. I immediately scooped it up and gave my taste buds a nice caramel coating. The swirl is definitely salty, but salty like chips not salty like a salt lick. This trick helped cement the caramel flavor in my mind so that it carried through my entire serving, something that did not happen at the press release. Mmmm, this second scooping definitely went better, though I seem to be stuck with a bit of a salty chip aftertaste with a hint of caramel. Caramel? Check! Fudge Covered Potato Chips? Check! In case you haven't had a pint yet, here are the now infamous chip clusters up close and personal. In general, they are in a ball (bottom left), but opened up you can see they almost look like rice krispies. Now I love chips, all kinds, regular, baked, kettle, etc etc etc, but I just don't love these bits. Oh, they taste fine and are fairly crunchy, but to me they just can't match a chocolate covered pretzel... or even a chocolate covered waffle cone piece. Yes, it's tasty, and yes, it's unique, but no, it is not the end all, be all to me. To reiterate: Good job on this one. Our buddy John the flavor guru has made a nice edition to the Ben & Jerry's line up. It's a quality product that a lot of people should enjoy, but if I'm stuck on a desert island and I have to pick, I'm going with pretzels over chips --- though I am glad there is plenty of room on the cabinet shelf for both in my house. On second Second Scoop: Well, that pint didn't last long, but it's not like it's easy to share a pint with someone anyway. This is a fine flavor, but I definitely think the best bites are when you get plenty of caramel. Those are definitely my favorite scoops. I'm dying to try this, since I love love LOVE chocolate-covered potato chips. 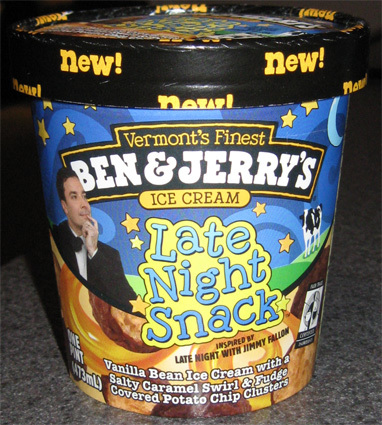 And, to be honest, I found Jimmy Fallon's appearance on "The Colbert Report" to promote this ice cream hilarious. No luck finding it in my local groceries, but this review has inspired me to try again. Thanks especially for the close-up of the chip clusters. It's okay, I guess, but Clusterfluff is about a million times better. This one just gets major play because of the Jimmy Fallon connection. I think after my plane lands in America in May, I'm heading straight to the grocery and getting a pint of Late Night Snack and Clusterfluff. But Britain has some flavors I haven't seen in America. Have you heard of "Baked Alaskan"? It has little white chocolate polar bears in it. Doesn't really taste like the dessert though. I finally got a pint. I love chocolate, chips and caramel so this was right up my alley. Nope! The ice cream was okay, the caramel was really good but the chocolate chip balls just didn't work for me. I was totally surprised because I love chips dipped in chocolate, but not this time. After a second tasting (and after I got all the caramel), the rest hit the trash can. Must be personal preference. Clusterfluff is also amazing - but the simplicity of LNS wins out for me. I'm sure there is some discrepancy with ingredient amounts between pints, but mine was seemingly perfect. imo, it's nothing special...red velvet cake, clusterfluff, and especially bonnaroo buzz were way better. Count me in the "eh" category on Late Night Snack. Got some to store at my BF's because I too was intrigued by the chocolate/ potato chip combo. The chips tasted like they were the crumbs at the bottom of a bag that had been open for a few days. Clusterfluff was much better, IMO. 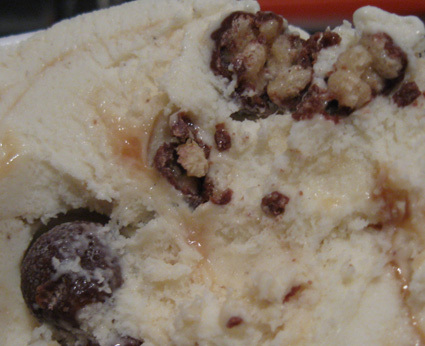 OK we just need to create our own ice cream I just tried half of a What a Cluster and two nights ago I finished off a pint of late night snack so I loved the salty clusters does it have to be potato chip clusters maybe I need to try a ice cream that has pretzel clusters. 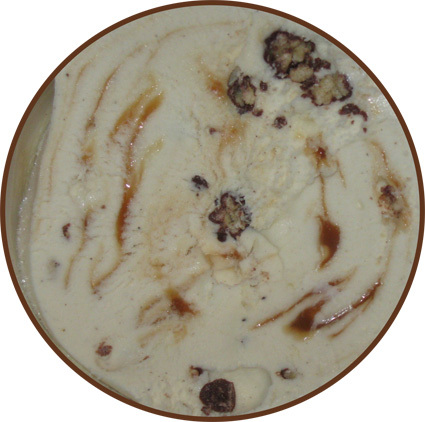 Either way the perfect ice cream need salty clusters, I love me some PB so it needs peanut butter swirl, and the swirl in late night snack, the caramel was really good and What a cluster's PB swil was great so make our perfect ice cream with a firm PB swirl and a gooey salted caramel swirl, lastly I love chocolate base ice cream with PB swirl so our perfect ice cream needs a Chocolate base. So to sum up make us some Chocolate Ice Cream with Peanut Butter swirl and a gooey salted caramel swirl and salty clusters, aka chocolate covered potato chip or chocolate covered pretzel. We can call it Midnight Scoop. Hear that B & J, or Turkey Hill or Breyers or HD.